Tyanna Buie weaves together her travels throughout New Orleans, Paris, and Berlin in her gripping new body of work. This certainly seems to be the case for Buie, who traveled last year to New Orleans, Paris, and Berlin and out of her experiences made a gripping group of works that bridge the foreign and the familiar. Most of the nine screen prints on display synthesize imagery and information from more than one of these destinations. While in New Orleans, Buie took the opportunity to learn more about the Creole roots of her surname, a search that took her to Le Museé de f.p.c., a house museum honoring the history of free people of color in New Orleans. There she learned about the tignon laws that required (free) women of color to wear hair covers. “I remember growing up wearing scarves, and black women have a history of wearing head wraps, but I didn’t know about these laws in New Orleans in 1800s,” said Buie during a walk through the gallery. 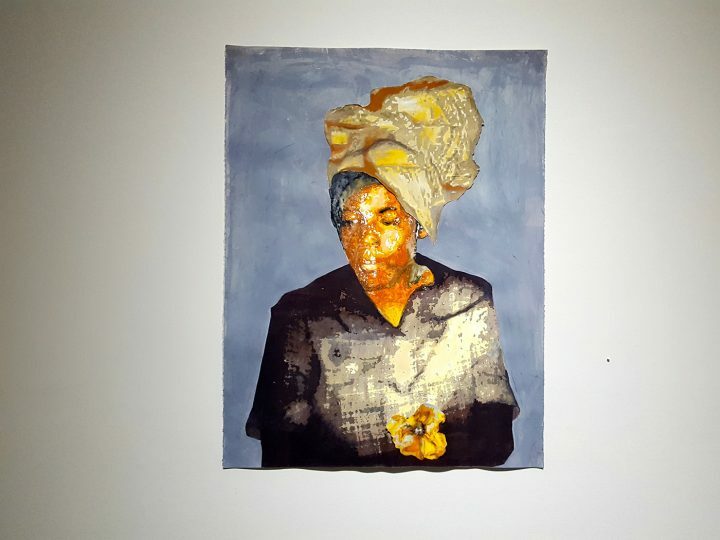 After this discovery, she went on to identify tignons in a few historical paintings featuring women of color, and lifted these head wraps out of the paintings, to superimpose them on portraits of women featured in On Vacation. “This is my first work that ties in more general history, beyond my family history,” said Buie. In the past, she has generally made large, site-specific screen prints that remix old family photographs with additional objects and decorative elements. “Woman Holding Magnolia #1” is a stunning image of Buie’s mother, photographed around the age of 19, prior to having Buie or her siblings, and the second portrait, “Woman Holding Magnolia #2,” builds upon an image of an unknown woman in Buie’s family pictures. All the images in the show involve multiple layers of screen printing, but Buie additionally added a great deal of hand-tinting to this set of images. 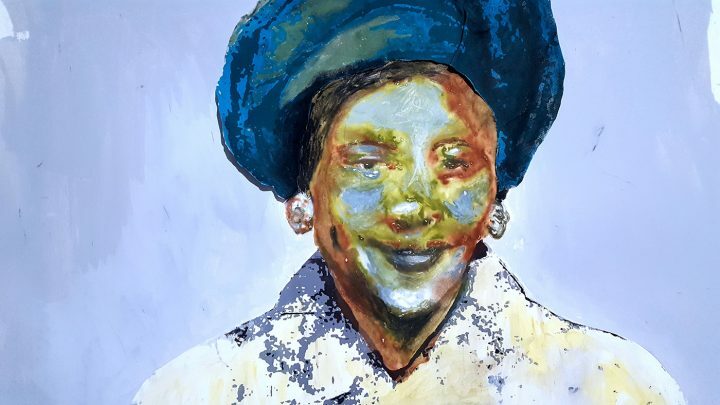 Each woman’s face is a mélange of colors, and there is a depth of connection to the portraits that shines through, regardless of their personal relationship to Buie. Three prints along the gallery’s entryway wall open like shop windows, displaying shelves stocked with hair and beauty products directed at women of color. Surrounding the consumer items is a highly decorative frame, which is in fact a photograph of the gates of Versailles, taken by Buie during her travels to France. 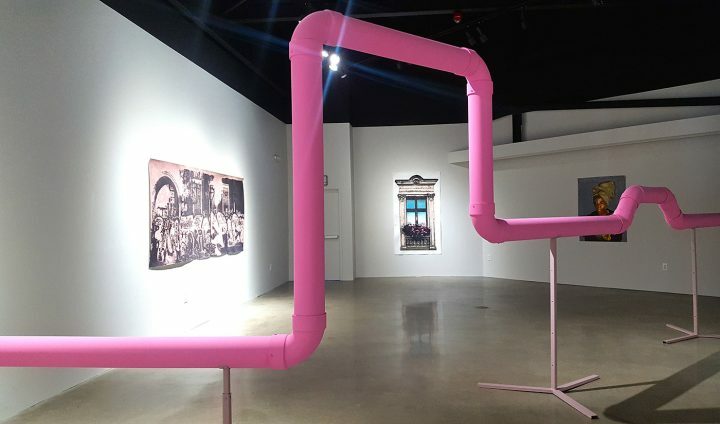 The gallery is divided by an installation of powder-pink pipeline, Buie’s attempt to replicate the oddly whimsical pipeline infrastructure she spotted all over Berlin during her travels there. Doorways and windows figure heavily in this body of work, representing Buie’s literal and figurative transitions between different states, places, and identities. Two pieces, both titled “Return,” lift elements of quotidian New Orleans architecture — a wrought-iron window grate and door that Buie often passed on her walks around the neighborhood. “At first, I took this because it reminded me of my door, that we grew up with in Chicago,” said Buie. “But later at the museum [Le Museé de f.p.c. ], I learned about the secret messages hidden in these iron works.” Since the manual labor of building New Orleans largely fell to workers of color, some of the common motifs incorporated symbolic imagery from Africa. “The S-scrolls represent the sankofa,” said Buie, “which means ‘to come back to’ [or literally go back and get it in the Twi language of Ghana].” The front door may seem imposing at first, with a padlock hanging from the wrought-iron grate, and a “Beware of Dog” sign behind it, but Buie has built out a set of poured concrete steps at its base, creating an invitation to rest upon your return. For an artist determined to go “on vacation,” Buie clearly manifests an equally strong longing to bring all she has seen back home. Tyanna Buie: On Vacation continues at CCS Center Galleries (201 E Kirby St, Detroit) through March 3.